The electric motor uses more electricity than any other technology. In the industrial world, it is estimated that 62% of all electricity is used to turn an electric motor. So it is not surprising that hundreds of millions of dollars have been spent by the Department of Energy and by private companies, in the quest to make electric motors more efficient. But improvements in motor technology have always come at a cost. Magnet improvements have resulted in higher torque density using neodymium-iron-boron magnets in brushless dc and ac induction motors. Magnet costs have come down substantially over the last few years, but typical induction motors don’t use magnets. Recent improvements in an induction design use magnetic poles on the rotor to increase torque, but this has to be balanced against the cost constraints of the application. Lamination steels have seen significant improvement in recent years. So-called exotic alloys have higher saturation flux and produce more torque for the same size motor. Silicon steels are more efficient and have lower eddy current losses which means less waste heat is generated in the motor and more flux is converted to torque. But exotic laminations and silicon steel cost more, so again, the gains have to be balanced against the costs. Tighter machining tolerances can generate smaller air gaps in the motor, which also translates into higher torque output. But precision machining requires better equipment, and amortizing the cost of equipment into the motor adds cost as well. So for every improvement there appears to be some cost impact to overcome. Until now. For the first time in the electric motor industry, reduced costs and performance improvements come from the same product. NovaTorque, Inc. in North Highlands California ( sales@novatorque.com or telephone 916 331-8000) has achieved the elusive goal of increasing performance and lowering manufacturing costs in the same motor design. The outstanding results of this new motor design come from rearranging the magnets and stator to create a rectangular magnetic circuit. This arrangement eliminates stator back-iron normally used to conduct the magnetic field through the outer ring of the motor. The magnetic path is shorter and has lower losses than any conventional design currently in production. Shorter magnetic circuits mean higher torque output for the same size of motor. 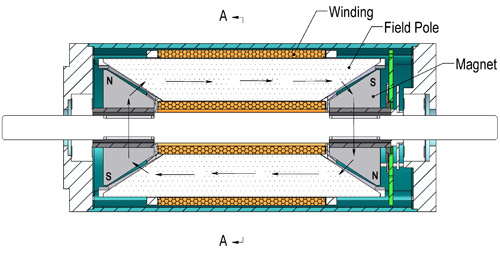 Conventional motor lamination is rolled thin so that the bulk magnetizing loss of the steel is minimized. But transformer steels are more efficient than other lamination steels because there is a favorable grain orientation in the direction of rolling that reduces magnetizing losses in the material by 7 to 8%. For this reason transformer cores are most often made by using strips of steel organized so that all the material in the core has the grain going in the direction of the core shape. Grain orientation in an electric motor has never been possible because traditional stator designs always have complex circular paths. Because the NovaTorque stator is all in straight lines, transformer steel is easy to use. This makes the stator more efficient, which shows up in higher efficiency over a range of speeds and reduces heat loss. Reduced heating can result in extended operating life, or higher current carrying capability for more demanding applications. As with other brushless designs, since the stator is on the outside the thermal path is better for cooling the motor. Heat doesn’t get trapped in the rotor as it would on a brush dc motor. So the major magnetic and electrical improvements lead to a lot of performance benefits. But the story doesn’t end here. The manufacturing process actually lowers the cost of making these motors at the same time. A real price and performance breakthrough. The rectangular magnetic circuit arrangement greatly reduces manufacturing costs by using simple straight line stator pole pieces that can be wound individually instead of in a complex circular profile, making the winding process simple and inexpensive. This method of stator construction is also called the Segmented pole stator. 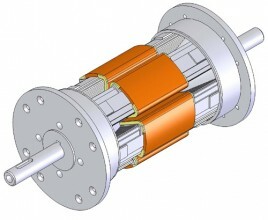 Segmented pole stators are stators that are wound a single pole piece at a time and then assembled into a stator ring. This method was introduced by Panasonic FA a few years ago on their brushless servo motors servo motors for electronic assembly machinery. The manufacturing benefits are substantial. Winding of a single pole piece is so easy, it can be done on inexpensive bobbin winders at high speed and low cost. This means that much of the capital equipment that is normally associated with electric motor manufacturing is not needed for this design. Thus, the amortized cost of making a high performance servo motor is largely eliminated and a lot of the process and labor associated with motor manufacturing is reduced as well. The segmented pole requires no end turn copper at the ends of the stator to jump from phase to phase of the winding, which reduces copper usage by 1/3 or more depending on the design. End turn copper produces no torque in the motor, so eliminating end turns reduces winding losses and improves efficiency. This also increases the maximum speed available to the motor designer. 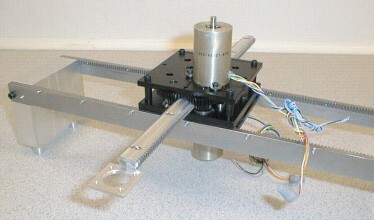 In addition, the space required to accommodate the end turn is eliminated so the motor can be made smaller in axial length. Less copper also means a lighter weight motor for a given power output. And in the current economic environment of rising copper costs, eliminating end turns helps keep motors costs down. Magnet geometry is simple. By making the magnets triangular, or conical, the straight pole piece easily makes the corners work to huge advantage. The angle of the air gap can be manipulated to create many different relationships which can be used to leverage the characteristics of different magnet materials. The triangular air gap path also produces more torque producing area than a comparable motor with a simple cylindrical air gap. Cumulatively, the materials improvements, the improved copper utilization and reduced magnetic circuit length all work together to produce some astounding results. 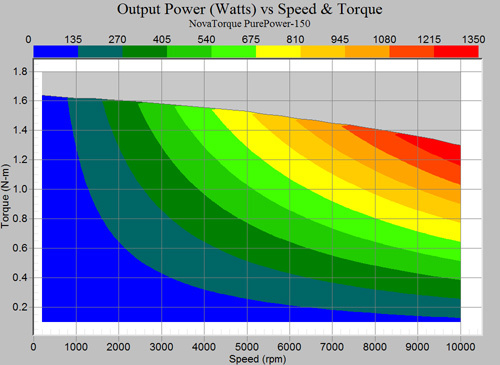 Testing shows the motor is more than 90% efficient over 90% of its speed range. 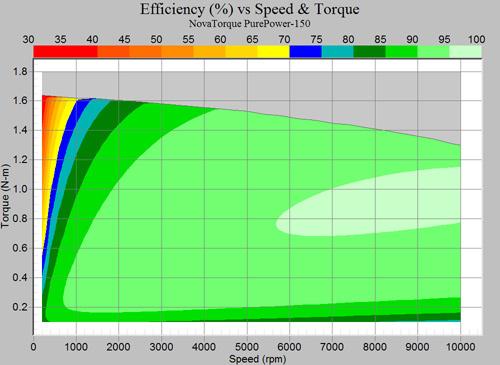 Most electric motors have high efficiency around a small speed range. A peak efficiency point is not as valuable as a range of high efficiency since as the system operates the on-time at varying speeds will usually produce lower overall efficiency. The Novatorque technology can have a huge benefit, especially in battery powered systems and hybrid vehicles where efficiency directly impact operating time per charge. The initial development of the technology was driven by a customer request for a brush-less dc motor for a pumping application, but requiring pricing more in line with stepping motors. After several attempts were made using conventional motor designs, John Petro and Ken Wasson developed the new stator and rotor configuration of the Novatorque motor and with Don Burch, the three set out to create a motor manufacturing company the could deliver the highest possible performance at lower costs than have previously been available. The company’s engineering team has over 100 man-years of experience in the field of electric motors and is pursuing pilot manufacturing this summer. Novatorque’s target markets are driven by applications that require outstanding energy efficiency, such as battery powered tools, scooters and electric vehicles, applications that require extreme energy density and small size such as aerospace actuators and down hole equipment, and industrial servo systems where low rotor inertia and high motor power density is valuable in making high speed automation systems that are compact and precise.